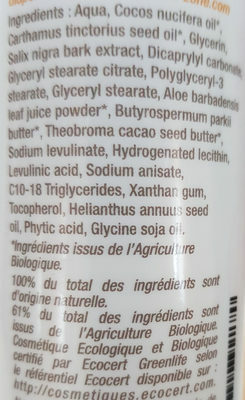 aqua, cocos nucifera oil, carthamus tinctorius seed oil, glycerin, salix nigra bark extract, dicaprylyl carbonate, glyceryl stearate citrate, polyglyceryl-3 stearate, glyceryl stearate, aloe barbadensis leaf juice powder, butyrospermum parkii butter, theobroma cacao seed butter, sodium levulinate, hydrogenated lecithin, levulinic acid, sodium anisate, C10-18 triglycerides, xanthan gum, tocopherol, helianthus annuus seed oil, phytic acid, glycine soja oil. Product added on October 19, 2018 at 10:09:04 AM CEST by openfoodfacts-contributors. Last edit of product page on December 9, 2018 at 1:20:03 PM CET by khorkaadren. Product page also edited by sebleouf.